Johnny Damon will be patrolling center field in the Bronx this season. I for one am looking forward to it. Damon reportedly signed a four year $52 million dollar deal to play for the Yankees. His agent, Scott Boras, had initially insisted that Damon would only listen to offers which included a guaranteed 7 years. After finally backing down from initial demands the Yankees upped their original offer from $48 million to $52. That proved to be the deal maker. Damon confirmed the deal on WBZ-TV in Boston. Damon had an offer from the Red Sox of $40 million for 4 years. It was an identical deal as the one Jason Varitek and Edgar Renteria signed during the last offseason. The Yankees liked the offer as Rafael Furcal has set the salary bar for a leadoff hitter at $13 mil/per with his $39 million 3 year deal. 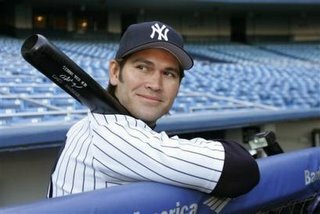 Damon's $52 million deal is also nearly identical to the one the Yankees gave left fielder Hideki Matsui this very offseason. The move came as quite a shock to everyone in Red Sox nation. Damon, who was practically the face of the organization was expected to resign this off-season. Damon signed with the Red Sox after the 2001 season with the Oakland Athletics. During his four seasons with the Sox Damon averaged a .295 BA with 14 home runs 75 rbi's and 115 runs scored per season. He also was the catalyst during game 7 of the 2004 ALCS when he hit two home runs including a grand-slam to beat the Yankees and send the Sox to the World Series.